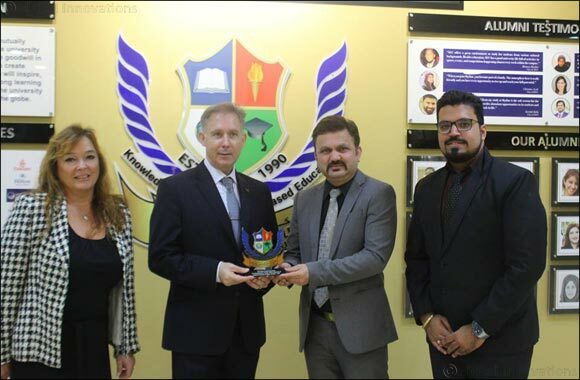 Dubai, UAE, December 6, 2017: Skyline University College has signed a memorandum of understanding (MoU) with Waldorf Astoria Ras Al Khaimah on November 28, 2017 at SUC Innovation Lab. SUC Deputy Director and Head of Marketing and Communications, Mr. Rakesh Gaur and Waldorf Astoria Ras Al Khaimah General Manager, Mr. Alan Stocker signed the MoU on behalf of their respective organizations. Also present during the MoU signing were SUC Corporate Affairs Office Head Mr. Pawan Bhatia, Waldorf Astoria Director for Human Resource Department Ms. Begina Campoy, and Waldorf Astoria Manager for Learning and Development Mr. Soham Natu – Manager. Both parties have agreed upon several points of future collaboration in terms of Scholarship programs for Waldorf Astoria RAK employees, Community Engagements, Career Opportunities for SUC students, Research Projects, Case Study Development, and use of SUC Facilities among others. The MoU was coordinated successfully by Corporate Affairs Office.